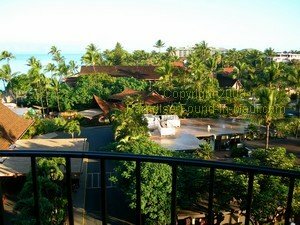 The Royal Lahaina Resort is the kind of resort you choose if you want a nice place, but don't want to spend the buckets of money it would cost to stay in a 5 star resort. 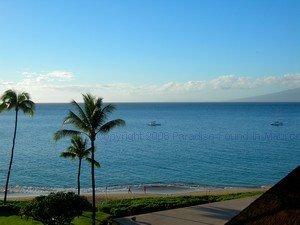 On our Hawaii vacations, we've generally been pleased with the 3-star hotels and resorts we've stayed at, so we figured the 3-star Royal Lahaina Resort at Kaanapali, Maui would be worth a try. 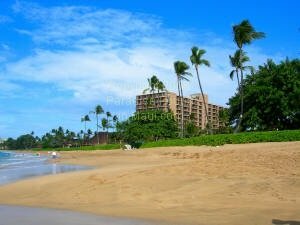 This Kaanapali resort wasn't perfect, but since we found more good than bad, I'm going to start off this review with all of the things that we liked about our stay here. There was a lot to like! 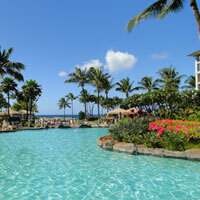 First of all, the Royal Lahaina Resort is located on the very best stretch of Kaanapali Beach, just north of Black Rock. 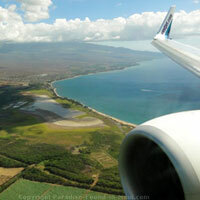 If you've ever taken a look at the beach south of Black Rock, where most of the Kaanapali hotels and resorts are located, you'll notice the beach there tends to be very crowded. In contrast, the beach in front of the Royal Lahaina is wonderfully free of crowds... there is lots of room to spread out, tan, and catch a few rays! The resort's 2 swimming pools are located just a few steps from the beach. Conveniently, you can even order food and drinks poolside... I loved the fact that we didn't have to dry ourselves off and go inside every time we wanted to eat... Food was available from the resort's Royal Ocean Terrace restaurant which overlooked one of the pools. For drinks, we had a choice of the Royal Ocean Terrace Restaurant bar, or the Barefoot Bar located in the cute hut alongside the cottage pool. While I'm on the topic of food, I should mention that the Royal Ocean Terrace Restaurant was great! We ate many a meal there, and thought it was overall quite good. The Royal Ocean Terrace Restaurant was the place we chose to eat if we wanted something casual and not crazy expensive. During the dinner hour, there is even free entertainment on the restaurant's outdoor patio. You know you're in Hawaii when you're eating to the sound of live hawaiian music and the hula! If we felt like a more elegant setting for dinner, then we'd go to Basil Tomatoes. Located at the entrance to the Royal Lahaina Resort, this restaurant featured Italian cuisine, and a beautiful view of the Kaanapali North Golf Course. The food here was more expensive than the Royal Ocean Terrace, but it makes for a convenient place to go if you'd like to make dinner feel a little bit extra special that night! We had booked a garden-view room, but when we arrived for check-in, we were asked if we would mind being upgraded for FREE to a partial ocean view room in the Lahaina Kai Tower. As I'm sure you can imagine, we didn't have to think twice about our answer to THAT question! Of course, we happily accepted the free upgrade! We thought our room was quite nice (and this was just before the resort had refurbished all of the rooms in the tower... now that they've been redone, I'm sure they're even better!) Our room had everything we needed, included air-conditioning, a small fridge, and a lanai (a.k.a. balcony). 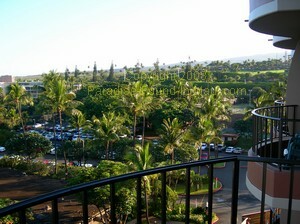 We ended up loving the view from our lanai: when we looked to the left, we had a glorious view of the ocean. Since this was only a partial ocean view room, I was very impressed! Directly beneath us was the main entrance to the lobby. Looking straight ahead we could see the rooftops of the resort buildings. To our right, was more greenery, and beyond the parking lot, a bit of a hill. We were quite satisfied with this view... when you book a garden view room, you never know what you're going to get... and as far as we were concerned, our view was fabulous considering we'd only been expecting a garden view. Firstly, the parking lot is very tight. we had to be extremely careful about parking our rental car in the exact center of the spot... if we were even a little bit off center, we'd risk being unable to get out of our vehicle... seriously... the spots were that narrow. The only other criticism I have about our stay here isn't really about the resort itself, but more of a buyer beware kind-of-thing. My husband needed to replace his old beat-up sunglasses, and decided to pick up an inexpensive pair at the resort's convenience store. Would you believe that 3 pairs in a row all developed cracks in the lens within a day or so of buying it? I know... I know... what did we expect from super-cheap sunglasses anyways... BUT, back home, the super-cheap sunglasses are all we ever buy, and they normally last us YEARS! My advice: if you're looking for inexpensive sunglasses, do NOT buy them here! If you normally stay at 5 star resorts, and are looking for a 5-star level of quality, then you will not be happy at the Royal Lahaina. However, if you're a connoisseur of 3-star Hawaiian resorts like us, I think you will absolutely LOVE the Royal Lahaina Resort. Out of all of the 3-star places we've stayed at on any of the Hawaiian islands, this one was our absolute favourite. The grounds were extremely well-kept, the beach out front was fabulous, our room was lovely, the resort restaurant food was great, and it had all of the amenities that we required. Would we stay at the Royal Lahaina Resort again? 2) Have the budget for somewhere a bit more upscale? 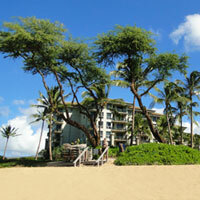 Read about the Kaanapali Beach Resort's 4-star Hyatt Regency Maui! Have A Comment or Great Story About This Topic? If you have a comment or a great story about this topic, I'd love to hear from you!